DAY TWO: THE WISE MAN'S FEAR "There are three things all wise men fear: the sea in storm, a night with no moon, and the anger of a gentle man." My name is Kvothe. You may have heard of me. So begins a tale told from his own point of view--a story unequaled in fantasy literature. Now in The Wise Man's Fear, Day Two of The Kingkiller Chronicle, Kvothe takes his first steps on the path of the hero and learns how difficult life can be when a man becomes a legend in his own time. Praise for The Kingkiller Chronicle: "The best epic fantasy I read last year.... 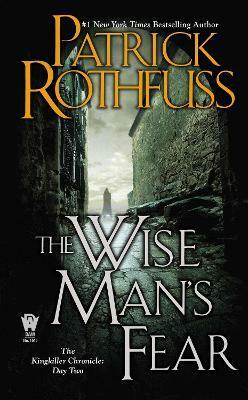 He's bloody good, this Rothfuss guy." --George R. R. Martin, New York Times-bestselling author of A Song of Ice and Fire "Rothfuss has real talent, and his tale of Kvothe is deep and intricate and wondrous." --Terry Brooks, New York Times-bestselling author of Shannara "It is a rare and great pleasure to find a fantasist writing...with true music in the words." --Ursula K. Le Guin, award-winning author of Earthsea "The characters are real and the magic is true." --Robin Hobb, New York Times-bestselling author of Assassin's Apprentice "Masterful.... There is a beauty to Pat's writing that defies description." "[Makes] you think he's inventing the genre, instead of reinventing it." "This is a magnificent book." "The great new fantasy writer we've been waiting for, and this is an astonishing book." "It's not the fantasy trappings (as wonderful as they are) that make this novel so good, but what the author has to say about true, common things, about ambition and failure, art, love, and loss." "Jordan and Goodkind must be looking nervously over their shoulders!" "An extremely immersive story set in a flawlessly constructed world and told extremely well." "Hail Patrick Rothfuss! A new giant is striding the land." "Fans of the epic high fantasies of George R.R. Martin or J.R.R. Tolkien will definitely want to check out Patrick Rothfuss' The Name of the Wind." "Shelve The Name of the Wind beside The Lord of the Rings...and look forward to the day when it's mentioned in the same breath, perhaps as first among equals." "Rothfuss (who has already been compared to the likes of Terry Goodkind, Robert Jordan, and George R. R. Martin) is poised to be crowned the new king of epic fantasy." "I was reminded of Ursula K. Le Guin, George R. R. Martin, and J. R. R. Tolkein, but never felt that Rothfuss was imitating anyone." "This fast-moving, vivid, and unpretentious debut roots its coming-of-age fantasy in convincing mythology." "This breathtakingly epic story is heartrending in its intimacy and masterful in its narrative essence." "Reminiscent in scope of Robert Jordan's Wheel of Time series...this masterpiece of storytelling will appeal to lovers of fantasy on a grand scale." --Ursula K. LeGuin, award-winning author of Earthsea "The characters are real and the magic is true." --Brandon Sanderson, New York Times-bestselling author of Mistborn "[Makes] you think he's inventing the genre, instead of reinventing it." --Lev Grossman, New York Times-bestselling author of The Magicians "This is a magnificent book." --Anne McCaffrey, award-winning author of the Dragonriders of Pern "The great new fantasy writer we've been waiting for, and this is an astonishing book." --Orson Scott Card, New York Times-bestselling author of Ender's Game "It's not the fantasy trappings (as wonderful as they are) that make this novel so good, but what the author has to say about true, common things, about ambition and failure, art, love, and loss." --Tad Williams, New York Times-bestselling author of Memory, Sorrow, and Thorn "Jordan and Goodkind must be looking nervously over their shoulders!" --Kevin J. Anderson, New York Times-bestselling author of The Dark Between the Stars "An extremely immersive story set in a flawlessly constructed world and told extremely well." --Jo Walton, award-winning author of Among Others "Hail Patrick Rothfuss! A new giant is striding the land." --Robert J. Sawyer, award-winning author of Wake "Fans of the epic high fantasies of George R.R. Martin or J.R.R. Tolkien will definitely want to check out Patrick Rothfuss' The Name of the Wind." --NPR "Shelve The Name of the Wind beside The Lord of the Rings...and look forward to the day when it's mentioned in the same breath, perhaps as first among equals." --The A.V. Club "Rothfuss (who has already been compared to the likes of Terry Goodkind, Robert Jordan, and George R. R. Martin) is poised to be crowned the new king of epic fantasy." --Barnes & Noble "I was reminded of Ursula K. Le Guin, George R. R. Martin, and J. R. R. Tolkein, but never felt that Rothfuss was imitating anyone." --The London Times "This fast-moving, vivid, and unpretentious debut roots its coming-of-age fantasy in convincing mythology." --Entertainment Weekly "This breathtakingly epic story is heartrending in its intimacy and masterful in its narrative essence." --Publishers Weekly (starred) "Reminiscent in scope of Robert Jordan's Wheel of Time series...this masterpiece of storytelling will appeal to lovers of fantasy on a grand scale." Patrick Rothfuss is the bestselling author of The Kingkiller Chronicle. His first novel, The Name of the Wind, won the Quill Award and was a Publishers Weekly Best Book of the Year. Its sequel, The Wise Man's Fear, debuted at #1 on The New York Times bestseller chart and won the David Gemmell Legend Award. His novels have appeared on NPR's Top 100 Science Fiction/Fantasy Books list and Locus' Best 21st Century Fantasy Novels list. Pat lives in Wisconsin, where he brews mead, builds box forts with his children, and runs Worldbuilders, a book-centered charity that has raised more than six million dollars for Heifer International. He can be found at patrickrothfuss.com and on Twitter at @patrickrothfuss.